What could be better than an eye-catching display of brilliant living colour to brighten your house or garden? Vibrant splashes of hanging summer flowers. Come and browse our selection of stunning flower hanging baskets - and discover one of Solihull’s little known, well-kept secret summer attractions! We are used to catering for orders of all sizes - from small, specialist hanging baskets to larger orders for hotels, pubs, restaurants, weddings, special occasions etc. We put many different types of plants in hanging baskets. Some of them have lovely aromas. Everything is grown and looked after onsite. Just let us know what colours, plants, or themes you'd like and we’ll put a special basket together for you. It is slightly cheaper to refill your old hanging baskets, but if you want to buy new ones to take home straightaway we have a full and colourful selection. Why not come down and see for yourself? The choice is yours! Supplemented by many other wonderful, distinct and colourful flowers too. We offer a delivery service for larger orders (for a small added charge). Contact Us for details. Or come down the nursery to have a friendly chat about what you’d like and to see what we do in person. How long is the Hanging Basket Season? Hanging Baskets are at their best in mid-summer. You may order your Hanging Baskets at any time, with pickup / delivery normally from early June. Early ordering is recommended to avoid disappointment. Autumn hanging baskets - less spectacular, but longer lasting and winter weather-resistant - are usually ready from mid-October or when the colder autumn weather comes in. They normally last right through the winter and into late spring. Can customers make their own Hanging Baskets? Yes, and many do. 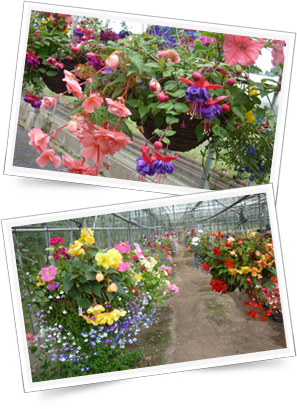 If you’d like to make your own hanging baskets we have a great selection of trailing and bedding plants and flowers (see the photos below for ideas/inspiration) to choose from, as well a stunning range of fuchsias and geraniums, both upright and trailing. We sell moss, compost and all the bedding plants you could wish for to make your own Hanging Baskets. We also do demonstrations for groups booked in advance. What plants and flowers can be used in Hanging Baskets? Almost anything really. But the skill is in knowing what to plant where and how because all can develop, climb or trail in different ways. We are always happy to offer advice and share tips etc. As soon as you can! The best time weather-wise to put summer hanging baskets outside is from around early June. With a little regular watering (not always absolutely necessary in the British summer climate!) the flowers and hanging basket plants generally last into October or even November.